Would you like to join the Quilts for Comfort Challenge but feel you cannot make a whole quilt? Well here’s the solution. Why not make a block and hand it over to the Quilts for Comfort committee? When we have enough blocks one of our volunteers will join them together to piece a quilt that will eventually bring a teenager comfort when they most need it. From week to week we will post block patterns to help you along. So let’s kick it off with the pattern for a Double Monkey Wrench. For this block you require two different fabrics. 2 fat quarters of contrasting colours will be fine. Match the 2-1/2” strip right sides together and sew them together. Press the seam to the dark side and cut into 4-1/2” sections. Match the colour (1) 4-7/8” squares to the colour (2) 4-7/8” squares. Draw a line diagonally and sew ¼”on each side of the drawn line. Cut in half on the pencil line. Press toward the dark, these form the corners of the block. Sew all the pieces together according to the diagram of the block which I have provided. 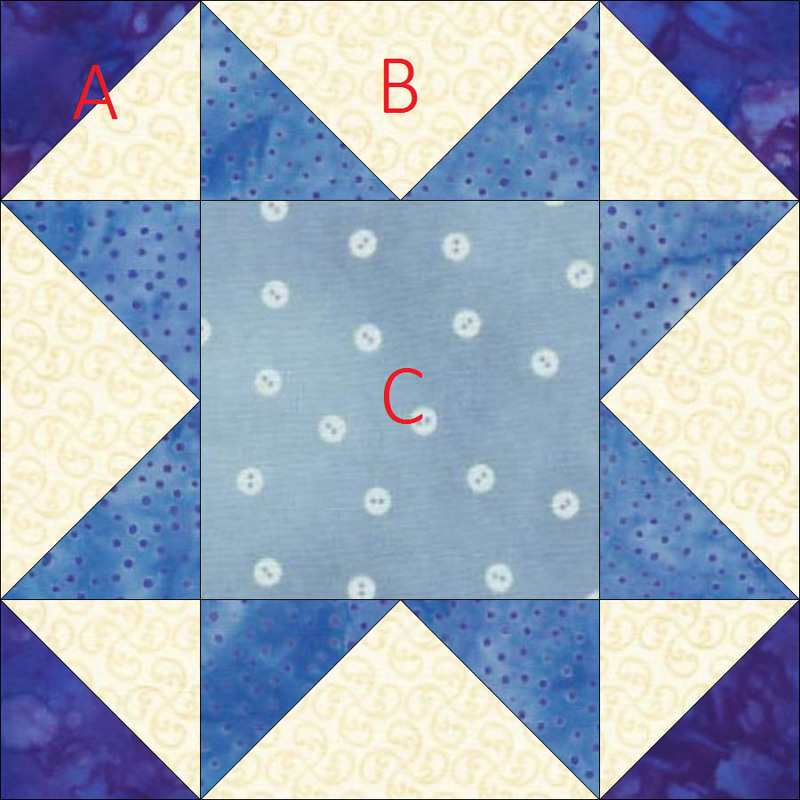 For this block you will need four different colours/fabrics. 1 strip 7-1/4” x 22” – from this strip cut 1 x 7-1/4” square (B) cut this square diagonally corner to corner twice. Now you should have 4 triangles. From this colour also cut 2 x 3-7/8” squares (A (corners). 1 strip 3-7/8” x 22” – from this strip cut 4 x 3-7/8” squares. 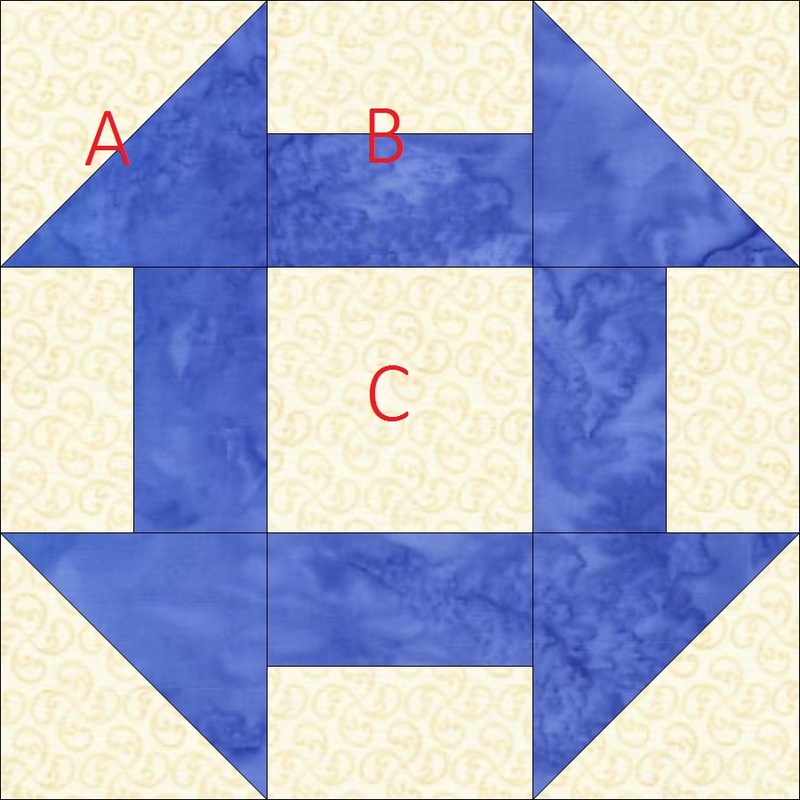 (A) Cut these squares in half diagonally corner to corner. Now you have 8 triangles for your star points. Now we sew. Layer 1 Colour (4) and 1 Colour (1) 3-7/8” squares, draw a line diagonal from corner to corner and sew ¼” stitch line on either side of the drawn line. Cut apart on the line and press toward the dark side. Trim the points. Repeat with this process with the other matching square. This forms your corner. Layer 1 Colour (1) large triangle cut from the 7-1/4” with 1 Colour (2) triangle sew together, press to the dark side. Repeat the procedure on the opposite side. Repeat this process until you have 4 flying geese type sections which form your star points. Trim any points. Please refer to the image provided to piece all the sections together that form this Variable Star. Trim any overhanging points and press. These instructions have been provided by Lucie the Happy Quilter on behalf of Quilts for Comfort. Thanks for popping in Gayle.